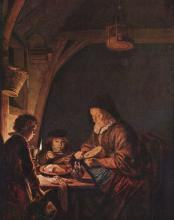 Gerard Dou (spelling variants Gerrit, Douw, Dow) (April 7, 1613–February 9, 1675) was a Dutch painter. 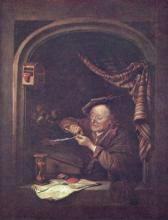 His first instructor in drawing and design was Bartholomew Dolendo, an engraver; and he afterwards learned the art of glass-painting under Peter Kouwhoorn. 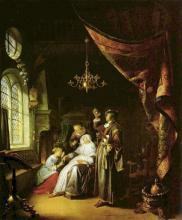 At the age of 15 he became a pupil of Rembrandt, with whom he continued for three years. 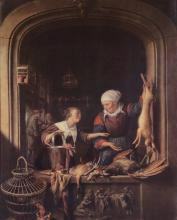 From the great master of the Dutch school he acquired his skill in coloring, and in the more subtle effects of chiaroscuro; and the style of Rembrandt is reflected in several of his earlier pictures, notably in a portrait of himself at the age of 22, in the Bridge-water House gallery, and in the "Blind Tobit going to meet his Son", at Wardour Castle. At a comparatively early point in his career, however, he had formed a manner of his own distinct from, and indeed in some respects antagonistic to, that of his master. Gifted with unusual clearness of vision and precision of manipulation, he cultivated a minute and elaborate style of treatment; and probably few painters ever spent more time and pains on all the details of their pictures down to the most trivial. He is said to have spent five days in painting a hand; and his work was so fine that he found it necessary to manufacture his own brushes. Notwithstanding the minuteness of his touch, however, the general effect was harmonious and free from stiffness, and his color was always admirably fresh and transparent. He was fond of representing subjects in lantern or candle light, the effects of which he reproduced with a fidelity and skill which no other master has equalled. He frequently painted by the aid of a concave mirror, and to obtain exactness looked at his subject through a frame crossed with squares of silk thread. His practice as a portrait painter, which was at first considerable, gradually declined, sitters being unwilling to give him the time that he deemed necessary. 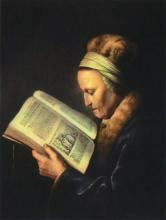 His pictures were always small in size, and represented chiefly subjects in still life. Upwards of 200 are attributed to him, and specimens are to be found in most of the great public collections of Europe.